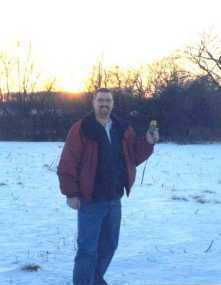 23-Dec-2000 -- During Christmas break, Anna (my wife) and I decided to find one of the easier confluences that was close to our hometown, Springfield, MO. So we loaded up the laptop, eTrex and camera and headed South West. I played navigator and Anna played chauffeur. Joe (Anna's brother) sat in back and was just along for the ride. Using Street Atlas USA 7.0, the laptop, and the GPS hooked together, we headed toward the point and hoped that we could find it easily. Sure enough, the laptop and GPS had it right on the money. Well, we went past it and had to turn around and find a place along the road to park. We found a gate along a fence that had enough room for the car to be out of the road. So we parked the car and unhooked the GPS from the laptop, and headed for the point. We didn't see any farm houses around that looked like they were the owners of the land there, so we just headed through the gate and started hiking through the snow to the point. I had not really considered the fact that there was still 6-8 inches of snow on the ground from the big 14" snow a couple of weeks earlier. I was the usual geek and took the lead with the GPS and they took their time and visited while I marched ahead. Picture #2 illustrates this. At least the field was level and open. We arrived in less than five minutes or so. It was getting late and we needed to head back for dinner, so we hiked back out. I waited a few minutes for the sun to get lower for the last picture. The two others I have done are 39N 92W and 39N 93W. 39N 92W was not that tough, but 39N 93W was a bear. Check out the story for that one. #2: Our long walk across a snow covered field. Joe (Brother In Law) and Anna (My wife) chatting. #3: Sunset on the way to the point. #4: Sunset on the way out. #5: And the best picture of the trip. Well worth the effort.